Mar 20 06:39: Magnitude recalculated from 5.3 to 5.9. Mar 20 06:41: Magnitude recalculated from 5.9 to 6.4. Mar 20 06:42: Magnitude recalculated from 6.4 to 6.2. Hypocenter depth recalculated from 27.0 to 2.0 km. Mar 20 06:55: Magnitude recalculated from 6.2 to 5.5. Hypocenter depth recalculated from 2.0 to 11.0 km. Mar 20 06:59: Magnitude recalculated from 5.5 to 5.9. Hypocenter depth recalculated from 11.0 to 2.0 km. Mar 20 07:04: Magnitude recalculated from 5.9 to 5.8. Hypocenter depth recalculated from 2.0 to 27.0 km. Mar 20 07:56: Magnitude recalculated from 5.8 to 5.7. Hypocenter depth recalculated from 27.0 to 11.0 km. Denizli, sümer park / MMI VI (Strong shaking): Le sol a bougé, le mur s'est fissuré, les portes s'ouvraient toutes seules. 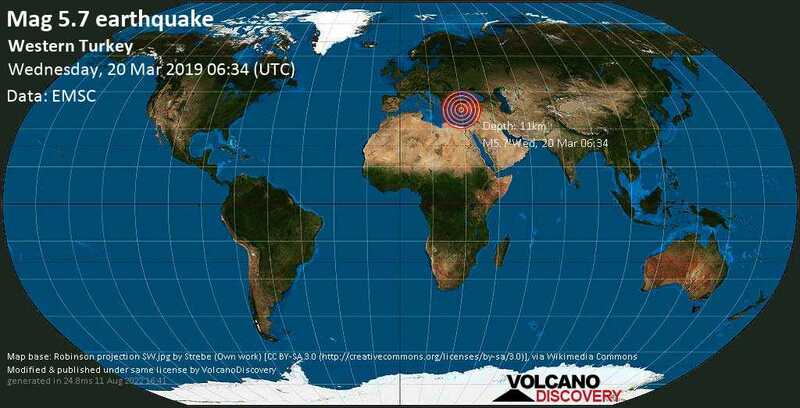 Civril / MMI VI (Strong shaking): In the centre of Çivril/Denizli, it has shaken quiet strongly. Göcek (86.2 km SSW from epicenter) [Map] / MMI III (Weak shaking): Couch was vibrating and ceiling lamp lightly swaying. Person standing didn't feel it. Civril / MMI III (Weak shaking): I was on my bed trying to wake myself to get to the school and out of nowhere my bed started to swing and my room's lamp was also swang. Beldibi / MMI III (Weak shaking): 2 x hintereinander ein leichtes Schütteln von jeweils wenigen Sekunden bemerkt. Izmir / MMI V (Moderate shaking): Was in bed and felt it quite strong. Chandelier still swinging slightly 4 minutes after !